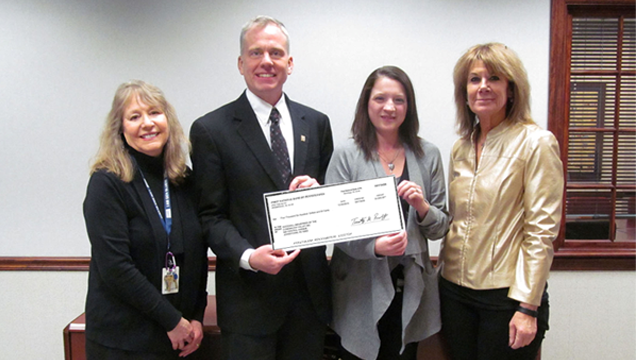 JOHNSTOWN, PA, January 28, 2016—Goodwill of the Southern Alleghenies has received a $4,600 charitable contribution from First National Bank through the Pennsylvania Department of Economic Development’s (DCED’s) Educational Improvement Tax Credit (EITC) Program. Goodwill is a state-approved Educational Improvement Organization under the program, qualifying the agency to receive contributions from businesses that want to reduce their state tax liability. Goodwill will apply First National Bank’s generous contribution to support Innovative Educational Programs designed to help prepare youth for the workforce through a variety of career services including career exploration, career development, and employability skills training. If your July 2015 Business Application has been approved by the DCED, and you received your conditional approval letter in December, the DCED will be informing businesses the week of January 29 that they can act on those letters and make their contributions to an approved organization. Please consider a contribution to Goodwill. To reduce your business state tax liability through a contribution to Goodwill, contact Ann Torledsky, Vice-President of Workforce Development at (814) 536-3536, ext. 230 or atorled@goodwilljohnstown.org.